On December 1, 1927, Ir. J.L. 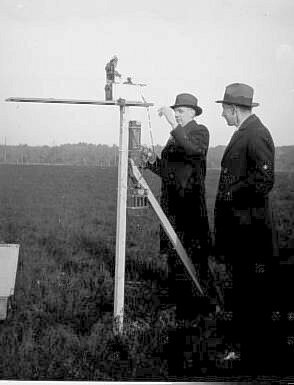 van Soest and mister P. Groot started the first forerunner of the TNO laboratory at the Plain of Waalsdorp in The Hague, The Netherlands. The ‘Meetgebouw’ laboratory was established by the Commission for Physical Armorment of the Dutch Ministry of War. As a result of these reports, questions were raised in the House of Representatives of the States General to the Minister of War. The minister dr. J.J.C. van Dijk promised to initiate an investigation into these reports. The Minister requested advice from Prof. Hendrik Antoon Lorenz. As a result of the conversation with Lorenz, Prof. jhr. dr. J.J.G. Elias was invited to act as chairman of a committee which would investigate this matter. On 25 November 1924, the Commission for Physical Capabilities was set up by ministerial order. Prof. Elias was appointed as chairman. The Commission had both civil and military members. The secret letter in Dutch (below) shows that the Minister, after having heard his advisers, gave the Commission a much broader assignment than merely the study of the existence of a killing beam. The establishment of the Commission was an act of foresighted statesmanship. Physics-based equipment and tools became increasingly important to the armed forces. Therefore, it was necessary to have an expert organisation. Soon the Commission came to the conclusion that, in order to work efficiently, the establishment of a laboratory was required where one or a few scientific people could carry out research. On 29 October 1925, the Commission addressed a letter to the Minister with a proposal for the establishment of such a laboratory, the purchase of instruments, and the employment of personnel. The minister reported by letter dated June 2, 1926, that the establishment of the laboratory could be started. On a proposal from the Commission, the building was situated in a quiet environment on the Plain van Waalsdorp (Waalsdorpervlakte). Moreover, the Commission was provided with a lockable test site. In September 1926, Prof. Elias asked Ir. J.L. van Soest to become the first engineer of the new to be built laboratory supplemented with an engineer and two technicians. Ir. J.L. van Soest accepted the offer after some time of reflection. He, however, wanted to initially start with two men only: one engineer and one technician. On February 15, 1927, Ir. van Soest entered into the employment contract. On 1 December 1927, instrument maker P.D. Groot joined forces as a technician. Now the investigations could be started in the newly completed building which also housed the Military Weather Service. The building was not called a laboratory but Meetgebouw (“Measurement Building”) to avoid reactions from anti-military movements and to keep the activities secret. By 1933 the number of employees had more than doubled and research and development in the field of radio probes and radio communication could also be started. One of the new employees was jhr. ir. J.L.W.C. von Weiler, the later director of the LEOK. 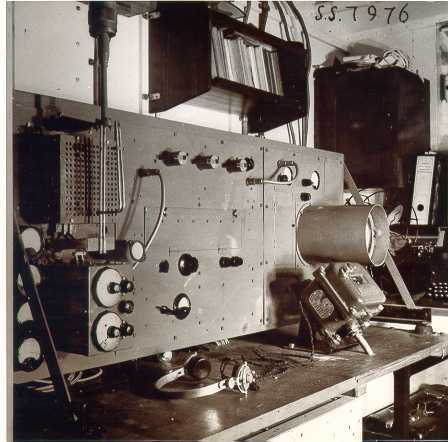 In 1934 he was commissioned to develop an ultra-short-wave transceiver. In 1939, manufacturing of these radio sets started. 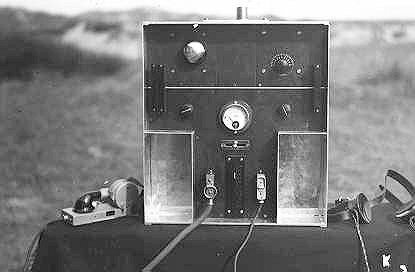 In 1940, the radios were commissioned by the Royal Netherlands Army. 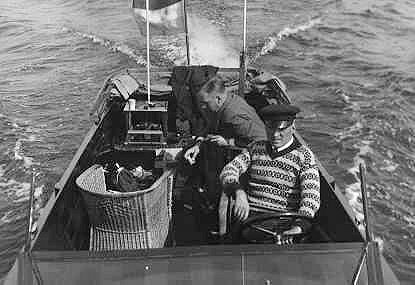 Von Weiler sails with the transmitter part of the ultra-short wave transceiver on the Westeinder Plassen to the measurement location. This channel part, left behind in the boat, is a pre-prototype called the “temple model”. 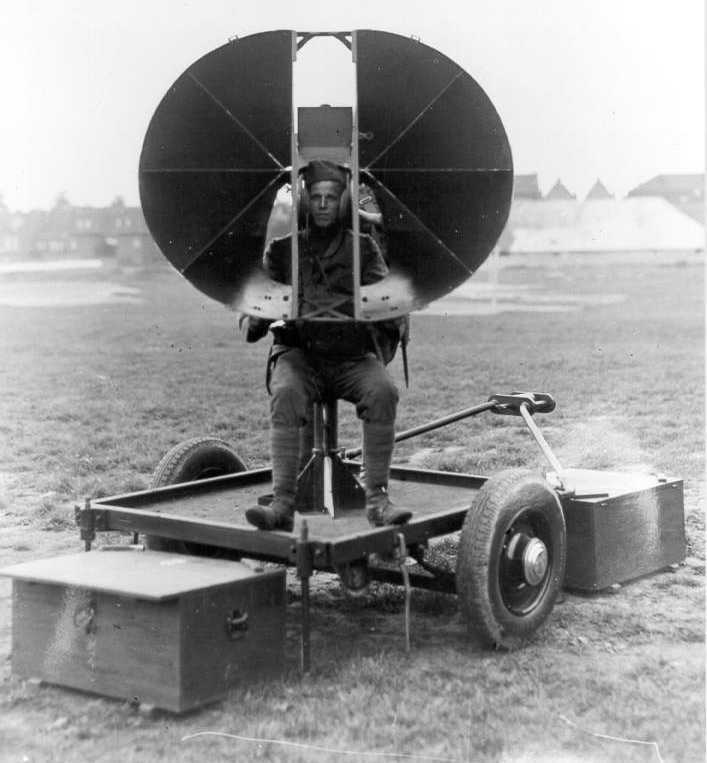 This ultra high-frequency communication research also led to the development of a Dutch radar, which – analogous to the acoustic listening device to detect aeroplanes – was called the electric listening device. 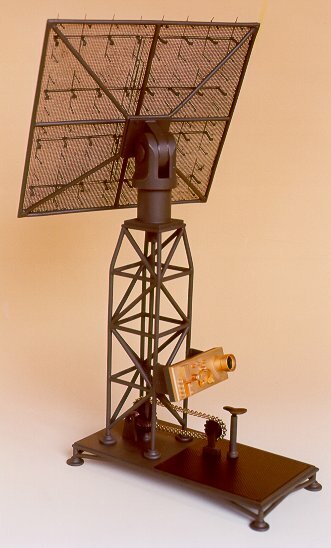 The electrical part of the first Dutch radar (electrical listening device) consisting of a transmitter, receiver and observing equipment. From 1934, activities were also developed in the field of infrared, such as the infrared security breach detection system for rivers. When considering the research areas in the period before the outbreak of the world war in 1940, it can be said that the foundations were laid for the research and development areas of the current laboratory. During the German occupation, the Measurement Building organisation was incorporated into the PTT organisation as Physics Laboratory PTT as of June 28, 1941. During the German occupation, the military work had to be stopped. Work was carried on with civil assignments. Examples include work on a high-frequency diathermy device and a DC amplifier. Underground, however, work was done on a large radio broadcast transmitter for use after the liberation of The Netherlands. After the liberation of the Netherlands in 1945, the original research and development activities were picked up again, but now under the name Physics Laboratory TNO. Only the radar investigation went with Von Weiler to the Laboratory for Electronic Development (LEO), the later LEOK. At the Physics Laboratory, research began in the field of microwaves, which ultimately led to the development of phased-array radar antennas. On December 1, 1984, the TNO Physics and Electronic Laboratory (TNO-FEL) was created as the merger of the TNO Physics Laboratory and the TNO LEOK. On January 1, 2011, the laboratory changed its name again: TNO location The Hague Waalsdorp. The staff association Meetgebouwfonds (“Measurement Building Fund”), however, still reminds of the original measurement building which was established in 1927. The first birthdays of the foundation of the Meetgebouw were celebrated at the home of its director ir. van Soest. The staff association actually arose from these celebrations. They started a piggy bank to buy flowers for a sick colleague or a wedding present. As a result of the increase in staff, the piggy bank soon grew into a “fund”, to which almost every member of staff contributed. It was now only a small step to establish a staff association, which naturally would bear the name of its origin: the “Measurement Building Fund”. The Fund acquired the formal status of an association with statutes and a membership board. In 1935, a special case arose when the first baby was born in the family of staff member J.W. Groenewold. A silver teaspoon with an inscription was handed to him. 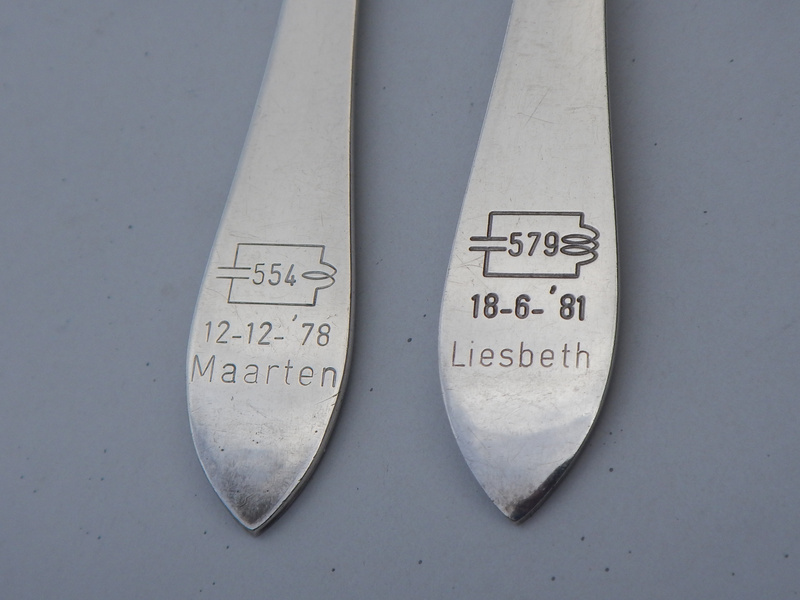 The inscription was an L-C vibration circuit, where the number of windings of the coil indicates the number of children in the family, and the number in the vibration circuits indicates the sequence number of the baby in the larger Meetgebouw family. 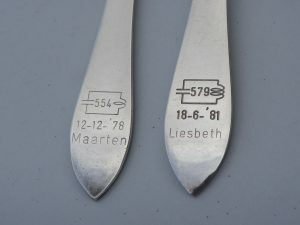 For twins, the spoon contained two linked circuits. This custom has been maintained until about 1985. 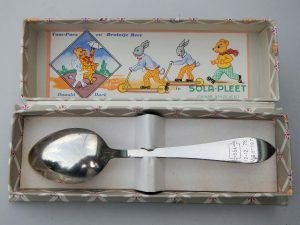 Left the inscription on the spoon for the 5th baby of a staff member and 50th baby of the “Measurement Building family”. At the right the inscription for a twin, respectively baby 76 and baby 77. After the War, the activities of the association were greatly expanded by the establishment of many sub-associations, from tennis club to car hobby club. Many have contributed to the success of the laboratory since its start on December 1, 1927. The two founders pioneers and from the start of TNO location Waalsdorp are ir. J.L. van Soest, the first director, and jhr. ir. J.L.W.C. von Weiler, the later director of the LEOK. For the team at Museum Waalsdorp it seemed a good idea to recall the past. For the drafting of the above text, data were used from the jubilee book “Physisch Laboratorium TNO 1927/1977”. This article was published in 2002 in the monthly edition “FEL-Gekleurd” by TNO-FEL on the occasion of the 75th anniversary and was updated in 2007 during its 80th anniversary and in 2017 during its 90th anniversary.